Powers/Abilities: Cloud, in her nebula forms, possesses great power, including manipulation of matter and energy on a planetary scales, instantaneous travel across space, and the ability to hold a breathable atmosphere in her form. She can also shrink or expand her form as needed. She possessed the ability to take on human form and memory. In her human form, she/he could turn into a living cloud with the power to fire lightning and mild telepathy. She could also shift her form from the template of Carol to the template of Danny. ((New) Defenders I#150 (fb)) – Cloud was a nebula in space, a few hundred million years from becoming a star. She was several times greater than the solar system. When Cloud noticed the stars in the sky disappearing around her, she grew frightened and her fear attracted the recently hatched Cosmic Cube, Kubik, to her. As they talked, Kubik told Cloud of the brave men of Earth (in particular Captain America), and reduced Cloud to human size so that she could go to Earth for help. 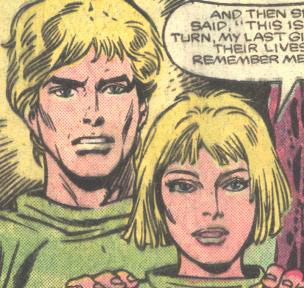 ((New) Defenders I#149 (fb)) – When Cloud approached the earth, she saw two teenagers, Carol Faber and Danny Milligan, who were driving down the road and very much in love. She tried to make contact with them and tuned into their minds, but she caused their car to crash. She took on both of their forms in an attempt to heal them, and was shocked by the pain they were experiencing. Her senses reeling, she ended up in Carol Faber’s form wandering aimlessly with no memory at all until the Secret Empire picked her and brainwashed her, giving her false memories and utilizing her powers for their cause. ((New) Defenders I#128 (fb)) – Cloud’s memories now consisted of her living happily with her parents, who knew about her powers but didn’t care about them. One day, Secret Empire airships came from the air and killed her parents in front of her, then Seraph grabbed Cloud and flew away. She was also made to believe that Seraph was her sister, though these memories don’t really seem to gel together. (Defenders I#123) – Cloud, Harridan, and Seraph were sent by the Secret Empire to kidnap the Vision. They found a hideout in Leonia, New Jersey. While scouting, Cloud saw the Beast, Gargoyle, and Iceman arrive and returned to report it. The three women attacked the home of the Vision and the Scarlet Witch, and Cloud burst through the wall in a blast of lightning. When the Scarlet Witch hit her with a hex, it knocked her into human form, but she turned to vapor and knocked the Witch out by depriving her of oxygen. Cloud helped stop Harridan from killing Beast and Iceman. The Gargoyle blasted Seraph and Cloud with bio-electricity, knocking them unconscious. He subsequently defeated Harridan. (Defenders I#124) – Cloud, Seraph, and Harridan were taken into SHIELD custody in null-fields. It is unknown how they escaped and returned to the Secret Empire. ((New) Defenders I#126 -BTS) – The Defenders discovered that Nick Fury had no record of Cloud, Seraph, or Harridan’s capture. ((New) Defenders I#127) – Rebelling when she realized her memories of Seraph being her sister were false, Cloud escaped from the Secret Empire and was pursued by Mandroids. She ran to the Defenders for help in cloud-form and Moondragon made telepathic contact with her. The Defenders attacked and Gargoyle zapped her into human form. Cloud was delirious and had a fever, and admitted that her whole life was a lie. Moondragon offered her comfort just before the Mandroids attacked, but the Defenders quickly beat them. Four more teams of Mandroids attacked and beat Cloud and the Defenders. They retreated, taking Cloud back to the Secret Empire. ((New) Defenders I#128) – Cloud recounted her memories when Professor Power confronted her. She broke free of her restraints and attacked him, but a null-field countered her powers and knocked her unconscious. ((New) Defenders I#129) – Seraph freed Cloud from custody, then they joined the previously captured Defenders in battling the Secret Empire, but they were too late to stop Power’s satellite from launching. ((New) Defenders I#130) – Cloud stopped Mad Dog from taking over the satellite, then watched it explode. After their battle with the Secret Empire was over, Cloud attacked Seraph for her part in the murder of her parents (as far as she remembered). Moondragon calmed Cloud, though, and Cloud asked for help. She joined the Defenders in battling Professor Power. ((New) Defenders I#131) – Cloud relaxed by the pool with her new team. ((New) Defenders I#132) – Cloud flirted with Iceman, and then fought Ephraim Soles with the team. She showed compassion towards Moondragon during the battle. ((New) Defenders I#133) – Cloud fought drug dealers with the Defenders and Cutlass and Typhoon in San Francisco. ((New) Defenders I#134) – While Cloud relaxed by the pool, Manslaughter placed a flower garland full of snakes around her neck, surprising her as she never saw him. Later, he almost killed her by slitting her throat, but she turned into vapor just in time. Still later, she hid in ice form when Manslaughter thought he’d broken Iceman’s neck. The Defenders barely beat him by careful planning. ((New) Defenders I#135) – Cloud fought Blowtorch Brand with the Defenders. She began experiencing feelings of love toward Moondragon, and felt guilty as she thought they were unnatural. ((New) Defenders I#136) – Cloud woke up distraught until Moondragon put her back to sleep telepathically. She dreamt of Moondragon and wanted to make her unnatural feelings of love justified, so subconsciously willed her body into its male form. She approached Moondragon, and the team rushed in, shocked, but they had to run off to find Gargoyle. ((New) Defenders I#137) – The Defenders attacked the Wizard, who willed Cloud back to human form. Angel saved Cloud from being crushed by a giant Gargoyle. After Gargoyle’s hand was severed, it turned into a demon, which Cloud slew with a lightning blast through its eyes. Cloud brandished lightning off of Valkyrie’s sword, blinding the Wizard. He was forced to look upon them with true sight, and saw Cloud as both a boy and a girl, separate but one. ((New) Defenders I#138) – Cloud scolded the Beast for calling Moondragon evil. Later, she changed back into a girl accidentally, then into a boy on purpose when Iceman tried to console her. Later still, Gargoyle shared Moondragon’s origins with Cloud, and they determined to do something about it. Cloud was present when Candy Southern was proclaimed team leader. ((New) Defenders I#139) – Cloud helped fight a manifestation of Mantis from Moondragon’s mind, then comforted Moondragon when Moondragon broke down sobbing. She helped the Defenders and Red Wolf fight the Jicarilla trolls. ((New) Defenders I#140) – Cloud helped Moondragon design a new costume, then relaxed and ate snacks with the team. Cloud confessed her love for Moondragon again, and was told by Moondragon that it had all come from Moondragon’s mind. Cloud left sadly. Cloud confronted the Heartbreak Kid with the team. ((New) Defenders I#141) – Cloud battled the Gamma Spores with the team. ((New) Defenders I#142) – Cloud confronted Adrian Castorp with Beast and Iceman. Cloud told Iceman that she still loved Moondragon when Iceman confessed his feelings for Cloud. She cried , saying she had no true memories except of the murder of her parents. After Adrianattacked, Cloud shorted out his system, crippling him. ((New) Defenders I#143) – Crying over what she’d done to Adrian, and over hurting Iceman’s feelings, Cloud grew frustrated and wished that she’d never met Moondragon. ((New) Defenders I#144) – Returning with Iceman and Beast to help the other Defenders in their battle with the Dragon of the Moon, Cloud felt guilty over not being there to stop Moondragon from succumbing to evil. As they got off the ship, the Dragon made it explode. While the Dragon battled a giant manifestation of the Valkyrie, Cloud was reunited with the rest of the team. Angel (who was blind) flew Cloud into the Dragon’s form to confront Moondragon. Cloud, angry over Moondragon’s manipulations and descent into evil, hit Moondragon with a lightning blast to the heart. Moondragon and the Dragon of the Moon disappeared. ((New) Defenders I#145) – An unconscious Cloud was taken to the mansion infirmary. Doctors examined her and noticed several irregularities in her physiology that showed she was dead. Seraph, in the guise of an army agent working with General Argyle Fist, looked over Cloud’s unconscious form and pulled about a newspaper article about Carol Faber, age 17, dying in a car crash. ((New) Defenders I#146) – Cloud flew with the Angel (still blind), guiding him through the air. She materialized as a boy and Candy gave him a jumpsuit to wear. Cloud went with the team to stay at Dr. Strange’s mansion. Cloud was struggling with her memories when Seraph revealed herself. Later, Cloud joined the team in battle with Hotspur. He flashed her with Muspel-flame, a searing soul-fire. Andromeda joined the team in battle. ((New) Defenders I#147) – During the battle, Hotspur caught the Defenders in a mass hallucination and they almost killed several innocents. Gargoyle, in a ploy to defeat Hotspur, reminded Cloud of all the pain Moondragon had caused her, and then used her telepathy to cause Hotspur to experience all that pain, defeating him. Seraph joined them, and revealed herself, stating she would reveal Cloud’s origins to them. ((New) Defenders I#149) – The Defenders agreed to accompany Cloud and Seraph as they tried to help Cloud recover her memory. They approached the place where Carol and Danny’s car had crashed, Cloud reacted violently and fired lightning through the ship. Seraph took her instead to the hospital where Carol and Danny were being kept on life support. Cloud realized, when she saw the bodies, that their personalities had been trying to override her for the last several months and that had been causing her identity crisis. They traveled back to where the car crash had been and fainted with the stress. The bodies of Carol and Danny began to enter cardiac arrest until Cloud finally got her memories back, when the bodies relaxed again. Cloud remembered the urgency of her mission and teleported the team into space. ((New) Defenders I#150) – Cloud, in her true form as a nebula, teleported the team inside her in outer space, providing them with enough oxygen to breathe. She recounted her true origin and asked them for help. They joined up with a group of aliens who had suffered from the stars disappearing. They tracked down the disappearing stars to Star Thief, and battled her race. Kubik joined them in the form of Captain America. The group was able to show Star Thief what love was, and the stars were all returned to the sky. Cloud confessed her love for Iceman in particular, then resumed her place in the universe, leaving her teammates and Earth behind. (Solo Avengers I#20/2) - Cloud, appearing in Carol's form, visited Moondragon (in a child's body), Gargoyle (in a gem), Sundragon, and Demeityr aboard their ship. They reminisced about Earth, and Cloud tried to raise Moondragon's spirits, confessing that she still loved her. Cloud missed Earth terribly, but didn't dare leave because of the stars her nebula body was creating. Cloud monitored Moondragon and saw that she continued to struggle with her evil side. When Moondragon attempted to slay Gargoyle and Pamela Douglas by casting them into space, Cloud rescued them. She awakened Pamela's Sundragon powers, and gave Gargoyle a new body from her own substance. Cloud confronted Moondragon in teh form of a dragon. Cloud later departed wtih Gargoyle, Sundragon, and Demeityr, leaving Moondragon to her own fate. (Star Masters I#1) – Cloud heard about the Charter Massacre. (Fear Itself: The Deep#4 (fb) – BTS) – A loose team of Defenders (Dr. Stephen Strange, Loa, Namor, She-Hulk (Lyra), Silver Surfer) moved for final battle against Nerkkod (Attuma) and his powerful armored Atlantean army. Dr. Strange sent out a magic call that gathered several heroes to aid them. (Fear Itself: the Deep#4) – Cloak transported the loosely formed Defenders (Black Panther, Blazing Skull, Cloak, Cloud, Dagger, Devil-Slayer, Gargoyle, Hellcat, Moon Knight, Son of Satan, Stingray) to aid in the final battle. The army was soon defeated and Nerkkod fled. Comments: Created by J.M. DeMatteis, Don Perlin, and Kim DeMulder . Perhaps Seraph tampered with the memories so that she might be able to use Cloud against the Secret Empire in the future. For more on the Charter massacre, and Cloud’s most recent appearance, see the Star Masters profile. Apparently, Cloud was meant to be a member. The stars in the Marvel Universe are sentient creatures. Among those identified are: Apalla, Grand Nebular, the Master of the Sun, Star-Lord's Ship, and those forced into human form and replaced by the Creators. Carol Faber and Danny Milligan were a young couple in love and out for a drive when Cloud’s approach on earth startled them and caused them to crash their car. Unbeknownst to them, Cloud took on their forms and became tied to them. While Carol and Danny lay in comas in the hospital, Cloud used their forms and their personalities even shone through. 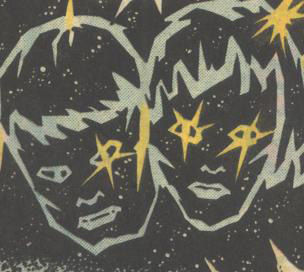 Later, their bodies were taken to DefendersMansionand healed by Moondragon, using the power of the Beyonder.